Graphic River has a huge array of elements you can incorporate into any sponsorship proposal to give it that wow factor – from backgrounds, to 3D renderings and infographics to name just a few. But what’s really cool about Graphic River is the range of ready-to-go proposal templates. Using the search box on the home page, enter “proposal” and you get back close to 900 results. From this list you’re sure to find a proposal template that suits your needs. Templates range in price from around $6 to $15 US. Nearly all the templates are provided as an Adobe InDesign document, which is a de facto standard tool for most graphic designers. The advantage here is that you don’t have to go through the design process as you have a template ready to rock and roll. Every sponsorship seeker should have a professional logo, it’s part of your visual identity, brand and personality. Getting a logo created by a graphic design company can be expensive. Alternatively you can get your next door neighbor’s son who’s a wiz with Illustrator to whip one up for you. Hmm… pass. Personally, I’ve had a great deal of success using Logo Tournament and I’ve even used for the Practical Sponsorship Ideas logo. Here are examples of logos I’ve had created using the service. Unless you’re awesome at everything, it’s time you started delegating the jobs you’re not that good at or don’t fit with your core business. Outsourcing is an excellent way to get things done and save some dollars at the same time. Services like Freelancer have emerged that allow you to connect with freelancers from all over the world who are ready to help you create a professional sponsorship proposal. Of interest to you and me are copywriters, graphic designers and illustrators etc. 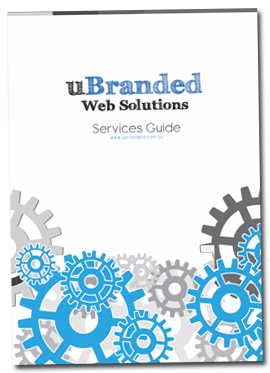 You can see the final version here: uBranded Services Guide. All this for just $170 US. As you can see, you can get a lot done with a little. A professional sponsorship proposal needs some visual bling, graphical elements that will grab you sponsor’s attention and excite them about the opportunity to partner with you. Not every sponsorship seeker has a library of high quality images they can use in a sponsorship proposal. This is where Shutterstock comes in handy. Shutterstock has a huge library of photos and illustrations you can use to make your sponsorship proposal really pop and give you that professional edge over the competition. It’s a fairly simple process. Sign up for an account, buy an image pack and then use the search tools to find the images you need and download them. For around $49 US you can get around 5 print quality images at this price. I use Shutterstock all the time for proposals and website imagery. So there you go; 4 tools you need to create your own successful sponsorship proposal on a budget. I hope you found this article helpful and you’re now enthused to go and tackle your own sponsorship proposals.